Is your sunscreen making you sick? Ideally, we use sunscreen for protection of our skin from the sun's UV rays and certainly do not expect it to make us sick! Best protection comes through generous application and so we do not expect it to be irritating, cause allergies, or lose effectiveness when exposed to the sun. Beyond that, we do not expect it to beak down into harmful by-products that can make us sick. However, besides toxic ingredients being used in sunscreen formulas, many also use extra “penetration enhancer” ingredients to boost the ability to stick to the skin. But as a result, we see these sunscreen chemicals absorbed into our bodies when they are seen in our blood, urine and even breast milk. In this 45 min video Dr Edward Gorham M.P.H., Ph.D of the University of California, San Diego reveals several facts about sunscreens that are directly opposite to what we have all been led to believe! How can we get all the benefits of health giving sunlight safely and effectively, without any of the toxins that many sunscreens contain? Sunscreen 'clever marketing' is often aimed at obscuring the truth and presenting you with the perception you are buying health and safety when in fact you're getting a potentially toxic solution. There are toxins present in many sunscreens that not only damage your skin, but can actually make you sicker each and every time you use them. We are all told to 'read the label' but in reality it is just plain overwhelming for the average individual to assess labels! For example, when you're on the receiving end of this curve ball... 'Monoethanolamine' your reaction is probably the same as most of us... huh? The most widely used sunscreen ingredient, has estrogenic effects (gender bending) noted in laboratory animals as well as disruption of thyroid hormone and brain signaling. Associated with photo allergic reactions. This chemical absorbs through the skin in significant amounts. It contaminates the bodies of 97% of Americans according to Centers for Disease Control research. Two recent studies highlight widespread exposure to this common sunscreen chemical, and associate concentrations of it in pregnant women to lower birth weight in their daughters (ref. Calafat 2008, Wolff 2008). Sunlight causes this unstable ingredient to break down into harmful chemicals, especially in the presence of another active, Octinoxate (see above). It produces oxygen radicals (cancer causing) when exposed to UV light. Research indicates it is a hormone disruptor, forms toxic metabolites, and can enhance the penetration of some toxic herbicides. Are all potent carcinogens containing dioxane (one of the most potent toxins known to man). Dermatitis, kidney and liver abnormalities, prevents skin growth, causes irritation. When combined with other chemicals, it becomes nitrosamine, a powerful cancer-causing agent; penetrates your skin’s moisture barrier, thereby allowing in other dangerous chemicals. These 'endocrine disruptors' are gender-bending chemicals which mimic estrogen, upset hormonal balance, and can cause various reproductive cancers in both men and women. A derivative of the once-popular PABA sunscreen ingredient, research shows this chemical releases free radicals, damages DNA, has estrogenic activity, and causes allergic reactions in some people. Causes genetic mutation when exposed to sunlight. Also called benzoic, benzyl, or butylated hydroxtoluene, it can cause anemia, low blood cell count, liver and kidney damage, birth defects. Circulatory collapse, paralysis, convulsions, coma, death from respiratory failure. Coats skin like plastic and clogs pores, trapping in toxins, slows skin cell growth, disrupts normal hormone function, suspected of causing cancer. Robs bones and nervous system of magnesium. Being petrochemicals they can have estrogenic effects. They absorb the oil soluble vitamins A, D, E & K from the body which are then excreted, thereby depleting the body of vital nutrients. FDA approved use of this UVA-absorbing agent in 2006. 2 hours of sunlight can degrade as much as 40% thereby leaving you without protection. But many ask the question, if they are so harmful why are they used so freely?
! Although full answers require too much detail for this letter, if you follow through with my suggestions below you'll get all the detail you could need in the days and weeks ahead. Now let me give you the short answer... because they are CHEAP! you need sunlight AND protection from it! Think of food or even water... have too little or too much of either and you will get sick! What health problems can result from a level of vitamin D that has sunk ﻿too low? ...countless research papers from the top research institutions provide irrefutable evidence of this. Research continues to reveal more and more benefits of this extraordinary free substance. (If the science interests you I'll show you how to get access to these papers a little later). So, it can't be more clear that... ﻿we all need sunlight for health and life itself. ﻿avoid the sun at your peril! ﻿what never to put on your skin? More than 1 million people in the U.S. are diagnosed with non-malignant skin cancer each year and 6% of these develop malignant melanoma according to the NCI. Approximately 5% of the solar light reaching the Earth consists of UV rays. Most of this light is skin-penetrating UVA radiation. This is what causes the real damage. 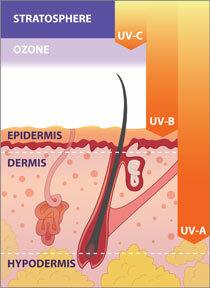 However, UVB, the fraction that causes sunburn, makes up just 4% of this UV light. More importantly it is UVB that generates vitamin D which protects against cancer. A third fraction, UVC, is filtered out by the atmosphere (ref. Diffey 2002). UV light can break the chemical bonds of skin cells, including bonds in DNA, enzymes, and proteins (ref. Burren 1998; Kielbassa 1997; Kvam 1997; Wenczl 1998; Young 1998). This kills cells directly, causes cancerous cell growth, inhibits the bodies' anti-cancer defenses and does other damage to skin cells (ref. Dalle Carbonare 1992; Herrling 2002; Scharffetter-Kochanek 1997; Vile 1995). For years the sunscreen industry has focused on UVB, the light that causes sunburn. The SPF test is designed to measure the UVB protection of a sunscreen, but not the UVA. UVA, however, penetrates deeper into the skin than UVB, thereby reaching the fragile subcutaneous tissue, and creates harmful free radicals when it interacts with certain chemicals in the skin. UVA induced stress leads to immune suppression (ref. Bestak 1995; Damian 1997; Iwai 1999; Moyal 1997). Naturally occurring chemicals have been linked to tumor formation (ref. Le Panse 2003; Bachelor 2004) after interacting with UVA which also increases skin sensitivity for people taking antibiotics, hormonal contraceptives and other pharmaceuticals (ref. Gould 1995; Ferguson 1995). UVA damage occurs before any visible sunburn and is increasingly being recognised as the major contributor to UV related skin damage and aging. This shift in our understanding of UV related skin damage points to the complete inadequacy of most sunscreens as they may effectively shield skin from UVB rays, but leave users vulnerable to UVA damage. Most people trust that the claims on the bottle will ensure that the product truly protects their health. Nothing could be less certain. Here's why... Less than 20% of the 600+ products analyzed by the Environmental Working Group (EWG) met basic criteria for both safety and effectiveness. Many products lack UVA protection. Many sunscreen ingredients break down in the sun in a matter of minutes or hours, and then let UV radiation through to the skin. Many high SPF sunscreens provide less than half the protection you need. When you buy a high-SPF sunscreen before heading for the beach or the mountains you, quite reasonably, assume you've purchased a product that will give you high sun protection. Its true that many high SPF ('Sun Protection Factor') products will protect you from sunburn, caused by the suns' UVB rays, but it's also true that very few of these these products block UVA rays, the more deeply penetrating radiation linked to skin aging and wrinkling, immune system suppression, and possibly skin cancer. The FDA does not require companies to provide UVA protection in sunscreen. Some sunscreens break down quickly in the sun and become ineffective. Several of the 17 'active ingredients' the FDA has approved for use as sunscreens in the US break down when they are exposed to sunlight. They lose their ability to absorb the sun's harmful rays, and stop working effectively in as little as 30 minutes. Almost all the 'chemical blockers' (as opposed to the 'physical blockers' zinc oxide and titanium dioxide) work by absorbing the sun's energy and then releasing it by breaking down. In doing so they react with other chemicals in the sunscreen, often producing dangerous free radicals. Manufacturers are not required to produce stable products. The EWG's analysis showed that 44% of them contained ingredients known to break down. Questionable product claims are widespread. Many products on the market bear claims that are considered 'unacceptable' or misleading under FDA's draft sunscreen safety standards. Claims like "all day protection," "mild as water," and "blocks all harmful rays" are untrue, yet are common. 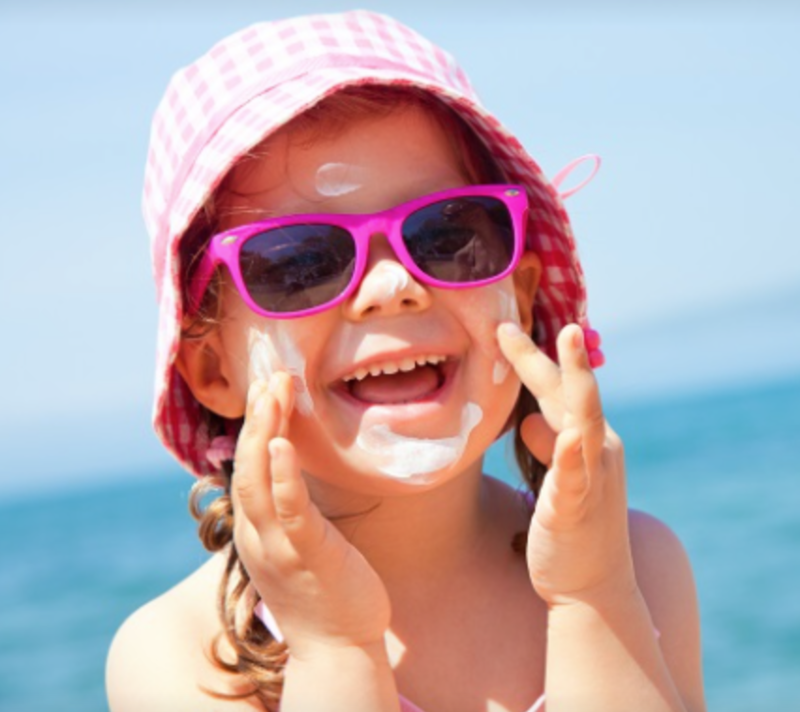 4 out of 5 sunscreens offer inadequate protection, or contain ingredients with significant safety concerns. This was the finding of the investigation of over 600 name-brand sunscreens carried out by the EWG. Many leading brands were the worst offenders! The study covered ingredients in thousands of products and utilized 50 toxicity and regulatory databases, making it the largest integrated data resource of its kind. The FDA doesn't require companies to test their own products for safety. Makes you think! Makes me angry! EWG's research references click here. So the bottom line is how can we spend some wonderful time embracing the sunshine to get the full benefits of Vitamin D and get protection from the sun's potential harmful effects? Let's not avoid sunscreens. Choose wisely instead.